If you are a customer you can be an awarded referrer in our program! Here’s how it works. Recommend our products to friends or audience and give them a €10 Discount Coupon. For each of your invited friend who makes a completed purchase, we will send you a €10 Discount Coupon that you can use on your next purchase with us. The more friends who buy using your Link / Code, the more coupons for you to use! Read all Program Rules. Get started now, by sharing your referrer Link / Code with your friends. You can track your earnings in your account. Log in and start sharing your Link / Code. This is what an Invitee see in the mailbox when he gets an invitation email from a Referrer. This is what a Referrer see in the mailbox when he gets an Award for an Invite’s purchase. The current customer referral program is valid from 1 January 2019 until 31 December 2019. The program implies participation of three parts: BecosFX, the Referrer, and the Invitee. We expect to have our products known and recommended to people through word of mouth, maybe sell more as a result. The Referrer gets awarded for recommending our products to friends and the audience. The Invitee buys our products at a lower price. This should be a win/win/win participation. €10 Discount Coupon for the INVITEE, to say thank you for your purchase. €10 Discount Coupon for the REFERRER on each of invitee’s purchase, to say thank you for your successful recommendation. Anyone can be an Invitee. Only customers can be Referrers. Discount Coupons are fixed in value and applicable to Cart Total. If an invitee accesses our shop through a referral link, the discount should be automatically applied by the system when the Cart page is loaded (if the user’s browser supports this automation). If the discount is not applied automatically, the code at the end of the link may be entered manually. When an invitee visits us directly they can enter the promo code manually. An invitee can use a referrer Code / Link for multiple orders during the lifetime of this program. An invitee cannot use more than one referrer code per one purchase, in an attempt to obtain even more of a discount. Referrers can share their link from their account (that is a custom-link which points to our homepage). Referrers can share their Link / Code in a call to action on their social media pages, blogs, forums, or any other way (including methods provided by us: social media buttons & email). The referrer is awarded only after an invite’s order is marked Complete. Referrers can track their invitees in their account. If an invitee’s order is Cancelled / Refunded while a referrer did not use the awarded code generated from that order, that code is void (reduced to zero) or deleted by the system. The referrer’s coupons accumulate from multiple purchases of invites. These awards can be used ONLY ONCE for purchasing products on our website. They can be used individually, some of them, or all at once – as long as referral program is available and codes are valid. A referrer Link / Code cannot be used in conjunction with individually issued coupons or with coupons obtained from more referrers. One or the other is applied in the Cart for either, the referrer or the invitee. A referrer cannot use its own Link / Code for purchase, but he can use someone else’s code, which means he acts as an invitee. Our system will generate links & coupons with a default duration of 1 Year. Beware that if these are published on the web and forgotten, in time may become misleading. This is not our fault. We encourage you to stop sharing them if BecosFX Referral Program stops. Thank you in advance for only sharing valid information and functional Link / Codes. Although an award-generated code for the referrer may show a validity period longer than the BecosFX Referral Program’s active time-frame, it is the program’s availability that will override the validity of any program generated code. We are fair with participants and we cut a lot from our profit to share it with you: enthusiasts, supporters, friends, users & customers. We expect you, the participant, to act in good faith as well. If there are suspicions of fraud, we reserve the right to stop the awards for the person under suspicion, with or without notice. Discount Codes might not be awarded in such a case. Additional measures may be taken: the user may be banned, the account may be suspended or erased, and the referral program may be interrupted or ended. 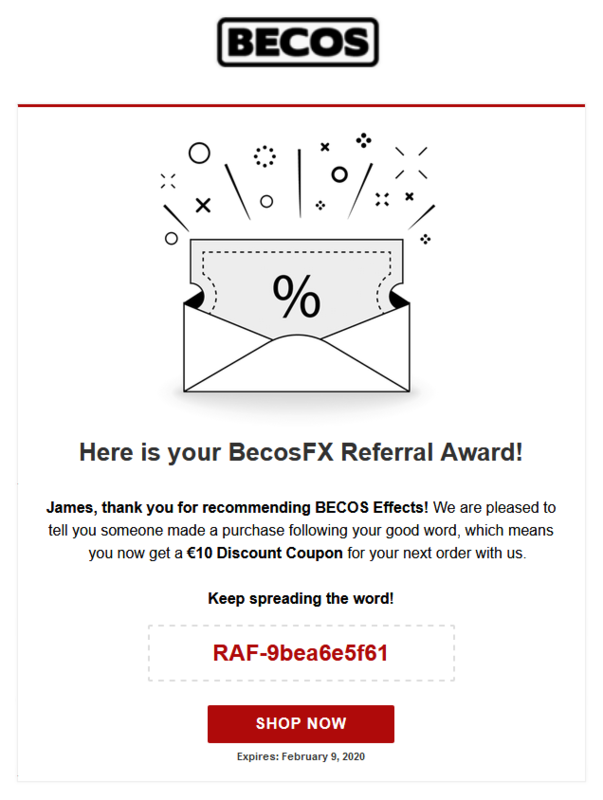 BecosFX Referral Program is offered as a courtesy, as is. No warranty regarding this program is implied or made. We will not be held liable for any kind of loss, to anyone. We want to make this program work for everyone involved, so things may need changing on the go. We reserve the right to change the BecosFX Referral Program’s rules without notice. Award type, amount, discount target or discount method may be changed at any time during the program. We are supporting this marketing program from our own work and from our own pockets. If it proves to be unsustainable, we reserve the right to end this it at our discretion, prematurely, any time, with or without notice, without owing anything to anyone. Unused referrer & invitee codes at kill/end time will no longer be usable. At our discretion, remaining valid codes could be converted in some other form of rewards, or not. If you have questions regarding this program, please contact us.